The Shimansky story began in 1991, when founder and CEO, Yair Shimansky, arrived in South Africa after spending two years in Japan. Yair started designing and crafting jewellery which he sold at a beachfront flea market in South Africa for one year before opening a small outlet in a popular shopping mall. This lead to the opening of a full Shimansky jewellery store two years later. This was a meaningful milestone in the Shimansky journey. While Shimansky designed jewellery for his clients, the manufacturing process was outsourced, and he soon realised that in order to deliver higher quality in a consistent manner, a hands-on approach should be taken. During a business trip to the US in the early 1990s, Shimansky discovered platinum, the most precious metal of all. This sought-after metal had only just started gaining popularity after it was banned for the manufacturing of jewellery during World War II. South Africa is home to 80% of the world’s platinum. It was an instant match, which made Shimansky the South African platinum pioneer. Today, Shimansky is among the world’s top platinum specialists. The same approach has been adopted for diamonds. In the early stages Shimansky bought them from diamond dealers, but became dissatisfied with the quality of the diamonds and their grading. Despite the many challenges that came along, where every mistake can cost you dearly, Shimansky entered the world of diamond cutting and polishing. Unique among jewellers, Shimansky has a license to buy rough diamonds and other precious metals direct from South African mines, leading to a fully integrated eco-system with natural treasures being created under full supervision and quality assurance. The Shimansky brand is respected worldwide and has the ability to deliver jewellery to most international destinations. The privilege and opportunity to be among the first to hand-select rough diamonds allow Shimansky to choose only the best diamonds, plus some unique and special diamonds for investment purposes (which can be sourced in the rough and polished for the customer). Shimansky was among the first to introduce Tanzanite. An African beauty, mined only in one known place to man: along a 4km strip on the foothills of Mount Kilimanjaro. With over 20 years’ experience of buying and selling Tanzanite, Shimansky sources Tanzanite directly from the Maasai tribe, where until today, they hold the right to the best quality Tanzanite found in Block D. Sold under the Ayanda Queen of Tanzanite brand, which guarantees the best quality Tanzanite, every Shimansky Tanzanite stone over one carat is certified according to the Tanzanite International Standard. Shimansky is known for unique and clean designs and attention to detail, and is a South African trendsetter. The brand’s designs have often been imitated, but never duplicated. The true value in a Shimansky original, is in its finer details. As a young man at the tender age of 22, Yair Shimansky embarked on a two-year journey to Japan, which served not only as a rite of passage into the world of diamonds and jewellery, but also as a major learning curve. It was here that he studied the art of diamond cutting and polishing, and where the Japanese culture of perfection made a life-long impression on him. Having learnt the intricacies of diamond qualities and different cuts, he was armed with a unique perspective and experience in life, starting in South Africa, with a never-ending pursuit of perfection. It was this pursuit that lead him to the sourcing of his own rough diamonds (after carefully examining the colour and cuts of the stones presented to him by suppliers, he realised they did not realise their full potential). This pursuit for perfection is something he carries with him throughout his journey, to every touchpoint. No jewellery creation will be presented unless it has realised its full potential. A pioneer in the diamond and jewellery trade, Shimansky has been named the “Platinum King” by the media, as he lay the groundwork for the use of platinum in South Africa. His invested interest and involvement in all areas of the business is one of the major contributors to the company’s success. By choosing a Shimansky jewellery creation, it allows you to create and own your own moment that will reward you through your lifetime, and continue for generations to come. The jewellery creation is a constant reminder of the special moment it represents and has the magic to take you to that special moment every time. Diamonds were formed over 3 billion years ago, deep within the Earth’s crust, where conditions of extreme heat and pressure cause carbon atoms to crystallise. This formation happens 150 - 200km below the Earth’s surface and under these conditions, molten lamproite and kimberlite (magma) are also formed within the Earth’s upper mantle. Here, it expands rapidly, causing the magma to erupt and forcing it towards the Earth’s surface. It moves at an incredible speed, forming a pipe as it moves towards the Earth’s surface, and takes diamond-bearing rocks with it. As it cools down the magma hardens and forms kimberlite and settles in vertical structures known as kimberlite pipes. These kimberlite pipes are the most significant source of diamonds, yet only 1 in 200 are estimated to contain gem-quality diamonds. It takes over 100 tonne of earth to find 1 carat of gem-quality diamonds. Once discovered here, the Shimansky diamond’s journey has just begun. Regular trips are made to South African mines, where only top diamonds are hand-selected for Shimansky from the mine production, known as the run of the mine. The selection process can take up to three days. With specialised equipment, laser mapping, 3D scanning and optical tools, combined with skill, experience and the most advanced tool of all – the human eye, only the finest rough diamonds are selected. These diamonds are re-examined in the Shimansky diamond workshop situated in the Clock Tower at the V&A Waterfront in Cape Town, South Africa. With over two decades of crafting and creating beautiful jewellery, Shimansky has expanded to include several jewellery stores. 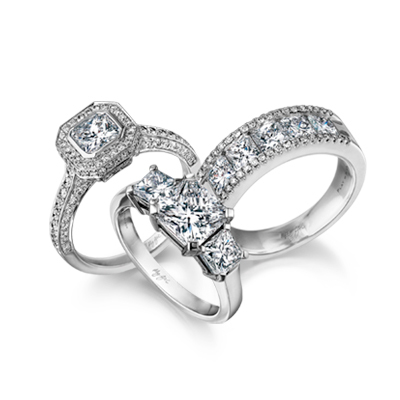 Each hand-selected diamond is cut, polished and set to perfection in Shimansky’s workshops in Cape Town. Cape Town is also home to Shimansky’s impressive jewellery showroom in the Clock Tower Building at the V&A Waterfront. Respected world-wide for innovative design and superior artistry, Shimansky has become one of the most recognised and revered jewellery brands in South Africa. To date, we have more than ten jewellery design patents, and more than five international diamond cut patents. The signature Shimansky Millennium Diamond Engagement Ring is the most coveted diamond ring in South Africa, and has become iconic in its own right. Similarly, the classic Shimansky My Girl diamond cut is sought-after all over the world, and was the first internationally patented diamond cut to originate in South Africa. We have the ability to create the jewellery creation that speaks to your heart, be it from one of our original collections, or a bespoke creation to suit your unique taste. A favourite choice among local and international clients alike, Shimansky jewellery has also been worn by a number of celebrities, including Charlize Theron, Christina Aguilera, Vera Farmiga, Bill Clinton and Nelson Mandela. Whether it’s an engagement, an anniversary, a special milestone, or a “just because” celebration, life is never short of meaningful moments. Shimansky is still in the early stage of its journey, with its eyes set on the international market. We aspire for our jewellery to be worn by people who understand the special moments in their life, worldwide. The quest for perfection is never-ending, and we believe that the best is yet to come.